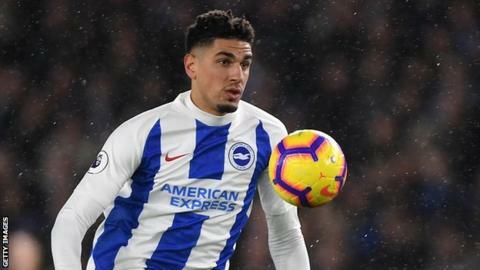 Brighton’s Nigeria defender Leon Balogun becomes the first African player in the English Premier League to join Juan Mata’s Common Goal campaign. Manchester United’s Mata wants players to donate at least 1% of their wages to football-related charities. “I feel we could be doing more to help those who are less fortunate,” Balogun said. Balogun’s compatriot William Troost-Ekong, Ghana’s David Accam and Lesotho’s Bokang Mothoana have already joined. “Joining Common Goal gives me the opportunity to actively help and support people in their communities and open up doors to a better life,” he added. The defender, 30, joined Brighton in May, and scored his first goal for the club in a thrilling 3-1 win over rivals Crystal Palace early this month. Born in Germany, Balogun, who has previously played for Hannover, Werder Bremen, Fortuna Düsseldorf and Mainz, has made 25 appearances for Nigeria. Mata is raising money for Common Goal, run by the organisation streetfootballworld, after being shocked by the poverty he saw on a visit to Mumbai, India. The Spaniard is aiming to create a ‘Common Goal starting XI’, made up of 11 players who each donate 1% of their wage to the charity.